Welcome to Grameenphone all selected customers are eligible to enjoy GP 20% Internet Bonus Offer. GP has come to their valuable customers get enjoy GP 20% Bonus Offer. To buy GP any internet package, customers will get 20% internet bonus.The customers who want to activate this offer under this package, customers need to just read this full content with attentively. Because in this bellow, i will share all more update information about the GP 20% bonus offer. 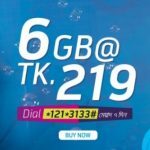 Grameenphone all prepaid and postpaid selected customers are eligible to enjoy this offer. This offer will run 6th July 2017. The Validity of the Bonus Volume will be the same as the validity of the pack that has been purchased. After Internet Volume Expiration customer will be charged Tk 1.22/MB (Inclusive of VAT+SC+SD) till validity exists, up to 244 Taka (Inclusive of SD+VAT+SC). To check your internet balance, just dial *121*1*4#. To cancel your internet bonus, customers need to dial *121*3041#. We hope finally that, all customers got a clear concept about the GP 20% Internet Bonus Offer details info. If you face any problem to activate this offer, please comment the box. We will try best to solve your problem as soon as possible. Thanks to all for being with us.